Reality is a cop-out for people who can't handle drugs. Let’s start with “book design”. Book design is something I’m not competent to do, let alone write about. However, for a piece of prose fiction it’s easy enough to make decisions about margins, fonts, page headers and footers, paragraph styles, and the like that won’t embarrass you too badly and won’t interfere with people trying to read your book; and that’s good enough for the vast majority of cases. Many people will argue that you don’t actually want people noticing the layout of the text in your book, because that would be interfering with people paying attention to the words. I agree with that, personally—but I also think that really good design can add to the reading experience without being intrusive. I’m also assuming you already know a lot of terminology—what the front matter is, what a title page and copyright page are, what body and display fonts are, what serif and sans-serif fonts are, and so forth. I’m not making assumptions about the software you’re using, so I’m not giving any detailed instructions on how to achieve any of the things I recommend. You don’t need a fancy page layout program like InDesign; you can implement the sort of simple design I’m recommending perfectly well using the Libre Office, Open Office, or Microsoft Office Write apps. There aren’t really rules about this. Your goal isn’t to get it “right”, your goal is to make your book easy and pleasant for people to read. For duffers, this means you should not try exotic or unusual things. Stick to the basics, do simple normal things that are known to work fine. My advice here is primarily for hardcopy books; variations for ebooks will be noted (primarily, margin rules are vastly different, you don’t really have control of the fonts, and page headers and footers aren’t available in ebooks). The half-title, title, copyright, acknowledgment, and other pages at the beginning of the book tend to be individually designed, not conforming to any standard scheme. The title page, in particular, is often a location in which some showing off of the design will take place. These pages probably shouldn’t have headers, footers, or page numbers on them. They do need margins, about the same as any other page (see below). In the kind of book we’re discussing, this consists of the actual content—the novel being published, in the case we’re discussing (with a few minor notes covering collections and anthologies). The inner margin needs to be larger than the outer margin, so that the “gutter” where the two pages that face each other in a bound book come together doesn’t swallow the text. Your printer/POD provider may well give you guidance here (CreateSpace does for example). They specify minimum inner and outer margins. Those are largely technical constraints, and are not big enough for a good reading experience. Your software will have ways to set different margins for even- and odd-numbered pages, or an even more convenient option to mirror the page layout automatically and let you specify “inner” and “outer” rather than “left” and “right” margins. For books in the 300-500 page range, CreateSpace gives a minimum of .625 inches inner margin. That’s conservative; I’m using .7, and I feel I’m pushing the limits to keep the page count lower. 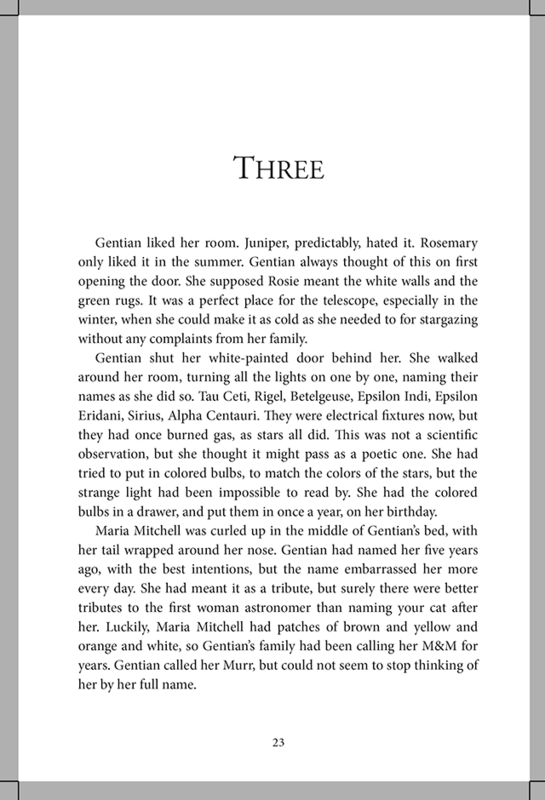 Ebooks basically don’t have margins (or they’re set in the display app). 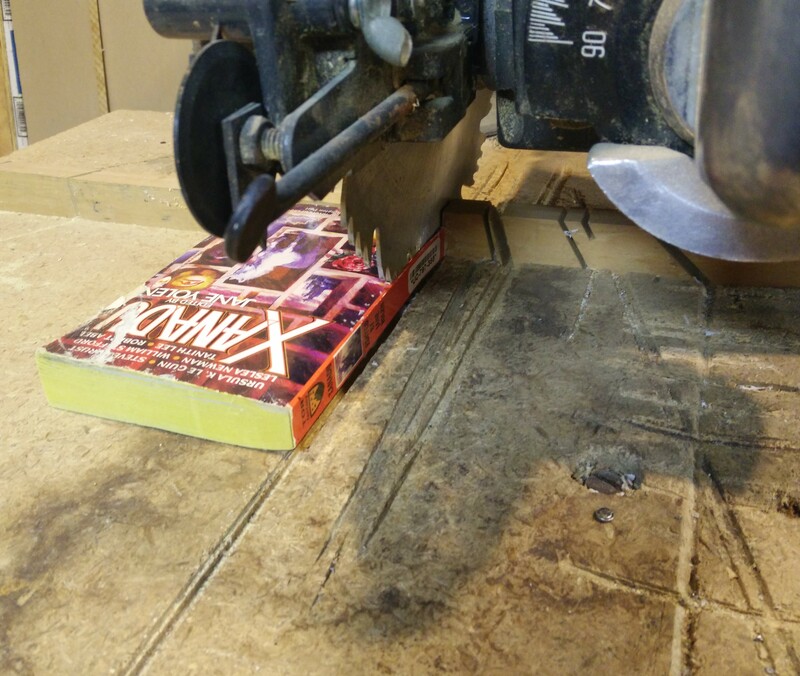 Readers expect and use page numbers, so you should include them. I think the least intrusive place to put them is at the bottom of the page, centered. I usually set them in the same font as the body text, perhaps a size smaller. Many novels have the author’s name as a running head on one side and the book’s name on the other. 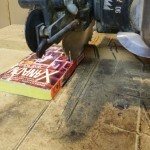 When they’re doing this, they often include the page number there too (usually at the outside edge). There’s nothing wrong with this—but I don’t really need to be told the name of the book and the author that I’m reading at the moment; if I need reminding, I can glance at the cover. And getting those added to the page without interfering with the rest of the design is harder than just putting the page number in the footer. For collections (a book of stories all by one author) and anthologies (a book of stories by many different authors) it makes a lot of sense to put the story title as a running head, though; it helps you find the story in the book. And at least for anthologies, including the author makes a lot of sense as well. Ebooks generally don’t have headers or footers, including page numbers. The font for chapter titles would normally be a display font (or at least a dual-use font). If you have actual titles, and not just numbers, for your chapters, avoid anything too complex (Magnificat is too complex—by a lot). And they should be several sizes larger, maybe in the 14-20 point range, but this also depends a lot on the font. Oh, and justify both margins. This is a book, not a term paper. For a novel body there’s really only one right way to paragraph: indent the first line some, around .2 inches maybe. Do not add extra space between paragraphs. Back up in the front matter, I tend to do the copyright page with non-indented paragraphs with space between them. But not for the body. Also, turn on widow and orphan control, both set to 2 lines. The body font is Minion, the chapter head is Garamond with small caps. We do seem to be serious about doing some sort of edition of “Owlswater”. I’m working on getting our edition of Pamela’s The Dubious Hills together, and I thought I’d blog about it. Deciding whether, or when, to go to self-publishing is a big complicated issued and I think it’s very heavily dependent on details about the particular situation, yours, that book, and the current state of the market. I’m not going to try to write about that, it’s really not my area of expertise. John Scalzi has written about it at various times on his blog Whatever, go find those posts over there. Since this is a previously published book (Tor books, 1994), the first thing of course is making sure we have the rights back. That’s long settled, but it’s important. It was close to being reissued by a publisher, in connection with the next book, but that fell apart (as industry conditions changed, I guess), and the rights are back with us. The next thing we do is decide how to publish and distribute. We thought a number of goals were obvious: make both paper and ebook versions available, try not to be too dependent on a single distribution channel, and try to keep open the possibility of bookstore sales and library orders. This requires some extra effort. The really easy thing to do is to publish a paper version through CreateSpace and click the button to also send an ebook version to Amazon (Amazon owns CreateSpace), but that leaves us completely dependent on one company. It also means the book isn’t available on the various non-Kindle e-reader devices (except to people who know how to use Calibre), and can’t be bought from for example iTunes. One fairly easy solution to that is Smashwords, which will distribute to a bunch of places for you. So that’s what we’re doing. Note that, while the first book we’re publishing ourselves is technically now available, it certainly has not been out there long enough to validate our strategy. I’m saying what we chose and why, but I’m not saying how well it’s worked, because we simply don’t know yet. Putting out an edition of a previously-published book is quite easy. You’re not, at that point, looking for input of the “developmental editing” sort, and you generally aren’t looking for a new copy-edit either (if you’re doing a revised edition, that changes things). You need a new cover (or you need to acquire rights to use the old cover), but other than that it’s all there waiting to be published. Of course, people don’t stumble onto it and buy a copy just by chance very often. The big problem in selling books today is being noticed. In our particular case, Pamela has a fairly small but relatively dedicated base of existing readers, and Pamela and I, and our friends, have enough web / social media presence that we can get the word out to most of the people who care fairly simply. That should give us a decent number of up-front sales (as I write this, we have 6 sales of the trade paperback of Juniper, Gentian, and Rosemary and 19 pre-orders of the ebook, within two days of it becoming possible to order at all, and before most of our attempts at promotion). That strategy doesn’t do anything to push out into new readers. A lot of that happens because of people recommending the book to friends, though, and a new edition gets people talking about Pamela again (“buzz”), which reminds people who have been intending to try her books, and all these little things add up. Also, one reason for the timing on this being where it is is that Pamela is a guest at Vericon next month, which with luck will contribute to more buzz. We’ve named our self-publishing operation Blaisdell Press, and it has a web page. The next step will be getting a nice electronic manuscript file. Which I will deal with in another post. Pamela and I have been working since at least last summer on bringing some of her older works back into print ourselves. It’s finally happening. We’re calling the operation Blaisdell Press, and our first products will come out March 1st—paperback and electronic editions of Pamela’s 1998 novel Juniper, Gentian, and Rosemary. We expect to go on to publish The Dubious Hills, and possibly a standalone electronic edition of “Owlswater” (a trade paperback of something that short would have to be kind of expensive per word, but we might try that too to see if people want to buy it). And then—we plan to publish the first edition of Pamela’s new novel Going North.